On why getting some things done just doesn’t happen. I thought today I would talk about the ridiculous ebb and flow of my enthusiams for projects. As you’ll notice if you read back through this blog, the last thing I talked about before taking a six month hiatus was my long list of thing I was going to get done. I did actually accomplish few, smaller, things such as the knitted present, but unfortunately it has been sitting, with an addressed postage bag, for five months (I am not making this up) because I couldn’t find a nice piece of paper to jot a quick note on before I sent it. In a similar vein, over a month ago I decided I would clean out my wardrobe, so I dutifully packed the unwanted clothes into a couple of bags and put them by my front door, to take to the local op shop. They’re still there. Not because the op shop is out of my way, or across town, oh no – it is actually only 5 minutes away. But since I regained my interest in sewing (which is to say, since last Tuesday) I have immediately been gripped by plans to sew EVERYTHING. I have already planned out a quilt, and a corset, and two more skirts. I’m trying really really hard to keep my WIP list under control because I know otherwise I will buy a lot of fabric and then use exactly none of it, instead drifting back towards something else to occupy my time. The other other thing is that I really enjoy being wrapped up in this kind of enthusiasm. I’ve been sleeping better, and waking up happy, and even though I’m dealing with all sorts of engineers reports and similar SNAFUs for my house I’m still quite excited to get home and sew at the end of each day. 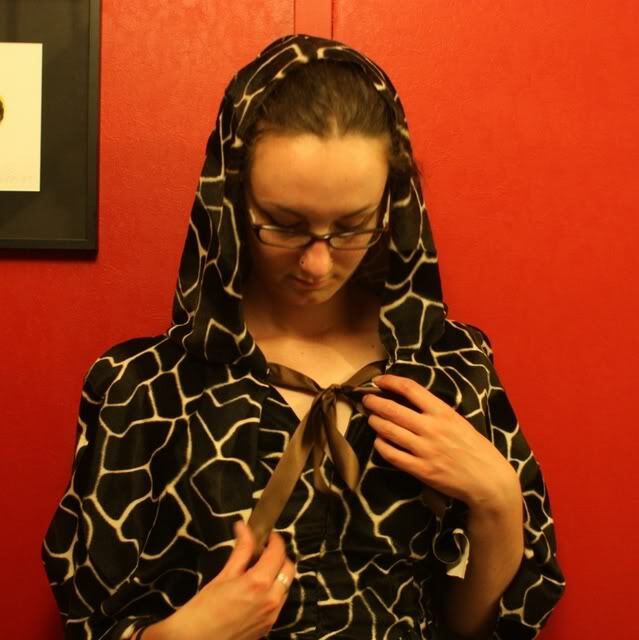 And here, so this isn’t just a bunch of self-flagellation, is a picture of me in the cape I made to match the brown dress I posted the other day. It hasn’t been lined yet (and the dress still needs a matching belt and a good pressing) but I promise I will do both of these things this week, maybe even tonight. I’ll post about it when I do them, so you can check up on me, if you like. Next up: fabric shopping on Wednesday, cutting strips of cottons I already own for the planned-quilt, and attending the Te Papa Unveiled exhibition for dress inspiration. Inappropriate daywear, here I come.